Derived - Kuhikugu Amazon - On 29 April 1925 Fawcett was still in contact with his wife through the telegraph , he said he would enter a closed area of ​​civilization in the Amazon, it will cross the upper Xingu river in southeast tributary of the Amazon. And since it is no longer heard news of them . Matto Grosso is the name of the river Xingu region around the spot where they disappeared . Many who thought they were killed by the local Indian tribe , tribe Kalapalos one of three Indian tribes who met with them last said that they looked like being sick . There is no corroboration of the killing by Indian tribes whose territory they enter . Because Indian tribes in the region of Matto Grosso friendly enough , except the Indians eastward. In 1927 a plate belonging to Fawcett's name was found on one of the other Indian tribes , but it turns out the plate is given directly by the Fawcett expedition to the head of the tribe in the previous 5 years . Companion anehdidunia.com in June 1933 , Colonel Aniceto Botelho find a compass belonging to Fawcett in the Mato Grosso region around settlement Bacairy Indian tribe . And the results of the investigation said that the journey into the wilds of the Amazon begins after the compass lags in settlement Bacairy . It could be that he had stopped in neighborhood , the intention to enter the forest and were hosted by Bacairy tribes and the compass brought forgotten . In a book I read ( The Fate of Colonel Fawcett ) , there are two other explorers who never met Fawcett in the interior of the Amazon , Fawcett said to live for five years with the Indians . He collects a wide variety of stone with a younger and a little older again . Tom Roch first adventurer who discovered them in 1931 in the Matto Grosso region . And one was Miguel Trucchi . To Miguel , Fawcett said he has a special reason to stay and live with the Indians inland , but their location in Matto Grosso not met in Rio das Mortes but . And in July 1933 , An Apostolic Administrator of Matto Grosso region called Monseigneur Couturon send notes via river journey when Kuluene that it mentions that they met three hallmark characteristics corresponding to the team Fawcett in 1932 , are reported Fawcett was written live and settle Aruvudu with Indians . Jack Fawcett junior had married Indian women and had a boy . But in 2005, another story emerged , a writer from The New Yorker , David Grann visited the Indian tribes Kalapalos and get the story by word of mouth that , Fawcett and his team settled with them for a while and move on to the east . Kalapalos tribe also warned them not to enter the civilization they are looking east directed it , because the area was guarded by Indian tribes who likes to attack . Five days sepeninggalan Fawcett eastward bumbungan visible smoke rising from their camp . All this was witnessed by tribal Kalapalos . The full story on the search trail Fawcett wrote the book The Lost City of Z. Well , we started the search . Kuhiguku is a relic of the past site of an Indian civilization in the Amazon rain forest , located in the southeast of the upstream river Xingu , Brazil . What is unique with this site , almost all of which is in write by Portuguese explorers in Manuscript 512 similar to this site . 512 manuscript recounts a large gate to the city surrounded by big houses and no temple in it , the mysterious city without residents who had a magnificent plaza , fountain pools and wide streets . Companion anehdidunia.com amazed anyone would definitely be amazed if you see the shape of a magnificent city that has never been seen at all . Well how Kuhiguku site ? Site was first discovered by Michael Heckenberger Kuikuro with local tribes that are descendants of the tribe Kuhikugu . The site is located in the upper Xingu river , has a twenty- eight towns and villages in an area of ​​7,700 square kilometers which is able to accommodate 50,000 inhabitants . Estimated civilization existed 1,500 years ago settled back around 400 years ago . 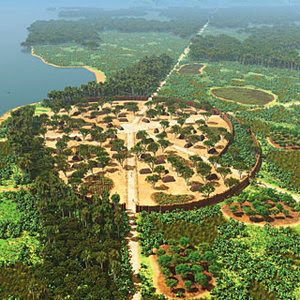 Many of the trenches that were built palisades around settlements , has a circular plaza measuring some 150 m in some cities . Towns and settlements Kuhikugu are connected by wide roads , rivers were set beside the highway with pedestrian bridges that can be crossed by canoe canoes below. Population living on farming , they also build dams and fish ponds . And the tradition of raising fish is still continued by Kuikuro tribe who inherited the tradition of their predecessors tribe , civilization Kuhikugu . The civilization began to be abandoned in the early inhabitants of the 16th century , when the European explorers came and settled in their settlements with a plague . Nearly two- thirds of the population died as a result of this outbreak , and the city was engulfed by thick Amazon jungle , until it was rediscovered by Portuguese explorers in 1743 and was named City of Z by Percy Harrison Fawcett . Well if you can compare the picture of the mysterious city of Manuscript 512 with Civilization Kuhikugu same location ? Xingu headwaters region of Matto Grosso is , has much in common with the Portuguese explorers encountered the city in 1743 . Google Earth Position : 11 232 S 53 185 W Kuhikugu site is currently a part of the National Park Xingu ( Xingu Indigenous Park ) covering an area of ​​26.420 square Kilometers in the Amazon rainforest , Brazil . Brazil's President at the time, signed the inauguration of Janio Quadros Xingu National Park on 14 April 1961 .